LOGi-Pi and LOGi-Bone are expansion boards featuring Xilinx Spartan 6 for respectively the Raspberry Pi, and the Beaglebone Black. Valent F(x), the company who designed the boards, is currently looking for funds via Kickstarter in order to bring the cost down to $89, or even $69 for early backers. Arduino compatible headers connected to the FPGA pins (3.3v only) supporting over 200 Arduino Shields. Bit-Stream loading interface connected to the host processor, optional bitstream FPGA self-loading from onboard Flash. Connection to 16 I/O of the Raspberry Pi expansion port (including SPI, UART, I2C and GCLK and GPIO). The boards can also be used in standalone configuration via the JTAG header, and a JTAG programmer. 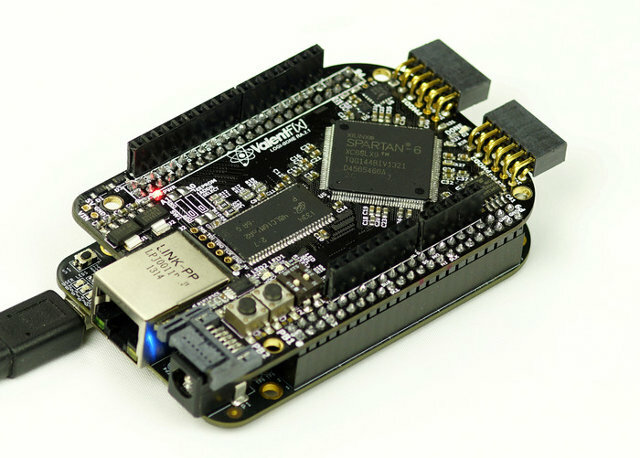 LOGi-Pi interfaces to Broadcom BCM2835 SoC via SPI, and LOGi-Bone uses the GPMC interface of the Sitara processor in the Beaglebone Black, so if you need high throughput, Beaglebone Black combines with LOGi-Bone appears to be a much better option. LOGi-Loader to load a bit-stream from the host development board with a single command: logi_loader file.bit. It’s also possible to automatically load a given bitstream from the host during system startup, and the user can configure the FPGA to self-configure from onboard flash each time the FPGA is powered on. LOGi-Driver – Host <-> FPGA communication driver. SPI driver for Raspberry Pi, and GPMC driver for the Beaglebone Black. 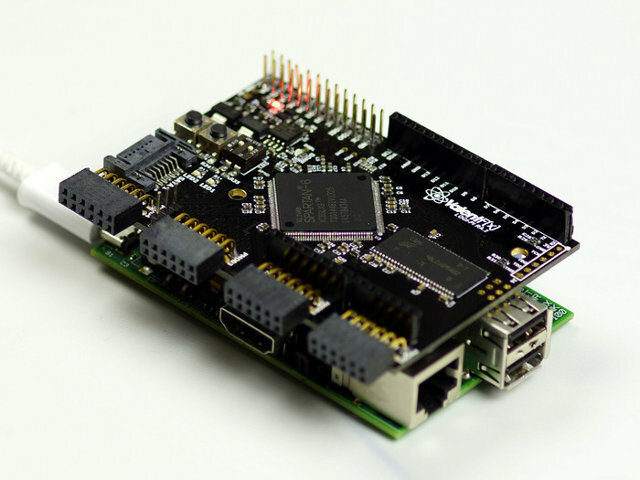 LOGi-Library is a C-library communication abstraction layer to enable the host development board and the FPGA to readily communicate with one another. For the Raspberry Pi, the library is a Python wrapper. LOGi-Hard – Open source IP that implements a wishbone master from the host processor, a set of wishbone peripherals (wishbone-registers, wishbone-memory, wishbone-fifo …) and a set of interface peripherals (servo-controller, pwm-controller, ad-controller, pid-controller …). More IP cores can be downloaded directly from opencores.org. Machine vision demo (using Jonathan Piat’s hard-cv library) – Run a Sobel filter, Gaussian filter, Harris corner detector on the LOGi-Cam and view the results in your web-browser with a custom mjpg-streamer plugin. Bitcoin-mining demo (using open source bitcoin miner) – Earn money while sitting on your couch. Autonomous Vehicle Control demo – This demo provide all the material to start designing your own Autonomous Ground Vehicle (AGV). The architecture controls the servo, runs a PID controller, and detect colors using the LOGi-Cam. A software stack written in Python handles inputs from GPS and an inertial measurement unit (IMU) to guide your AGV through a series waypoints. The software, HDL, demos, and hardware files are available in their github repo. The LOGi-Cam mentioned above is another add-on board with the OV7670 sensor to add a camera to the LOGi boards. The project had a low target of $6,900, and they’ve already raised over $12,000, so the project will go ahead. If you are interested you can pledge $89 for the LOGi-Pi or LOGi-Bone, adding the LOGi-Cam will cost a total of $115. If you have a Raspberry Pi and a Beaglebone, you can get a bundle LOGi-Pi + LOGi-Bone for $135. Shipping is $10 outside the US, and delivery is expected in April 2014. You can also find getting started guides, and Raspbian and Ubuntu images, and more technical details on Valent F(X) Wiki.